We Left Zagora for the long drive across the Jbel Sahara a single-track metallic road to Merzouga a distance of over 200 miles with only three villages and one petrol station, which we found out, later to be closed. With a light foot on the throttle we made it, even though we had our first break down since leaving UK. With the road being single track, every time you met a vehicle coming the other way whether it’s a truck or a grand taxi it’s a game of chicken that the tourist is bound to lose. You have to pull onto the hard shoulder, sometimes at speed. The hard shoulder is lower than the road and filled with large, sharp stones. With our caravan being a twin axle I did not realize that I had received a blow out. It was when nature called in the middle of nowhere that not only did I see the tyre ripped from the damaged alloy wheel but also the body of the wheel arch had been also damaged from flying shreds of Dunlop!! Whilst Liz prepared lunch, I changed the wheel patched up the damage with gaffa tape and we were on our way. We arrived at Merzouga in the evening with the famous Erg Chebbi as its backdrop. Erg Chebbi being a huge towering, drifting, expanse of sand dune. Morocco’s only genuine Erg. Plus the dunes themselves that change colour from pink to gold to red at all times of the day. Unless you get a sand storm as we did one day and you see nothing and the sand gets everywhere. Kasbah Tomboctou was to be our campsite for ten days. 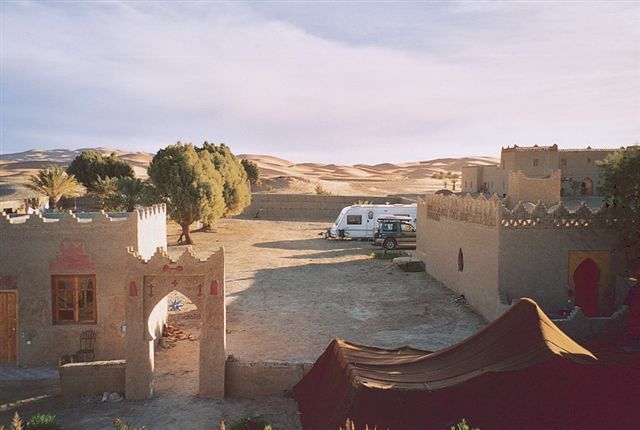 A large kasbah with plenty of guest rooms, and outside in the desert, Berber tents erected on a permanent basis, which had lounges and bedrooms all decorated in Moroccan style. 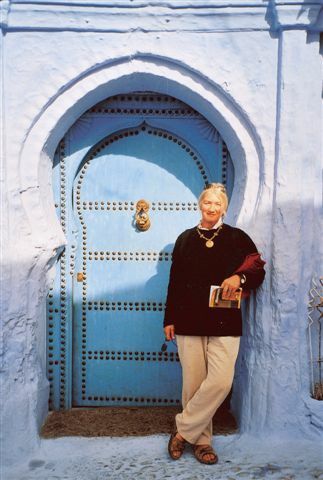 There was also built separate from the kasbah washrooms, toilets and showers, which were cleaned several times a day. We found the restaurant very good value for money, and we were only charged 20dirham a night including electrics and water. Whilst here we visited many Berber camps out in the desert did a lot of off roading, visited the town of Rissani with its palmeraies, Its a bit of a cross roads of a place where long distance coaches stop off to change passengers for different destinations, throughout Morocco. (There are no trains in this part of the country). 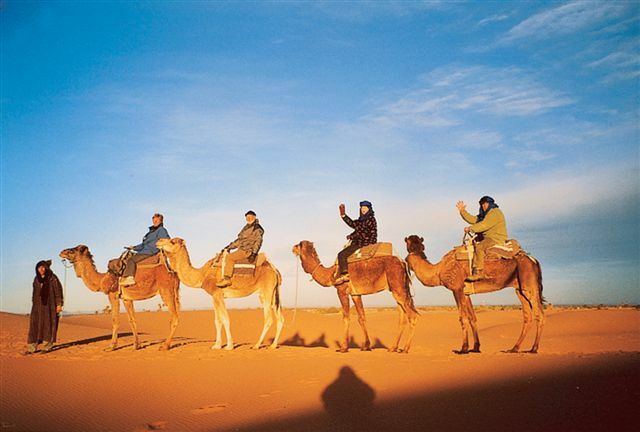 We also got up one morning at 4am and took a guided camel ride out into the dunes and then up Erg Chebbi to witness sunrise, which was fantastic and also fantastic, is the sky at night. With no pollution and no streetlights the stars and the odd satellites light up the whole sky. It was now mid February 30f and getting warmer as we left Merzouga. Liz was getting itchy feet to go ski-ing,(Actually they do ski on the sand dunes) so we turned and with our back to the Sahara which we really and truly loved we headed north.. We stopped overnight at a camp site in the Valley du Ziz at the source of the Bleue Meski It has a natural spring spilling into a. swimming pool. Not the place we would go swimming. The whole place was dirty including the showers and toilets. The staff just lounged around drinking tea and smoking what appeared to be kif!! 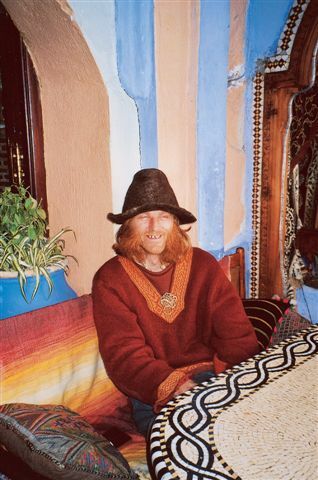 We used the caravan, the only time we did in Morocco and departed early next morning. We passed through Er-Rachidia a large town an a important crossroads of routes that cross north to south and east to west. Built by the French as a military outpost with a large army garrison still active. As you drive out of town on the Meknes road within two miles on your right you will see trucks parked up with empty gas bottles stacked on their trailers. This is another gas depot where they will recharge you gas bottles while you wait. I know of no other such depots in Morocco except for the one at Agadir.so take note. As you leave Er Rachidia on a well-surfaced two-lane road you start to climb. This is a spectacular route which passes through the Ziz Gorges and the Tunnel du Legionnaire built by you know who. Then up into the snow line and over the Tagalm Pass at 1950 metres, which drops down to Midelt via hairpin bends into the valley bottom. You begin to notice the terrain is turning green we see flowers and grass, something we had not seen for several months. Then its up and over The Col du Zad at 2200 metres, before dropping down once more into the town of Azrou. It was late in the day. We picked up and sent E-mails had something to eat and found a campsite. The next day we arrive in Meknes Known as the Versailles of Morocco, with impressive buildings such as Dar Jamai Museum, The Mausoleum of Moulay Ismail, The huge gate of Bab el Mansour and much more. The Souq we found was very good, with abundant olives, citrus fruits, cereals, wine, etc., all products from around this area. We only intended to stay a day or so here, but there were so much to see in this hassle-free city. We used the camping site International d’Agdal about a mile from the city, which was clean and tidy with good security. 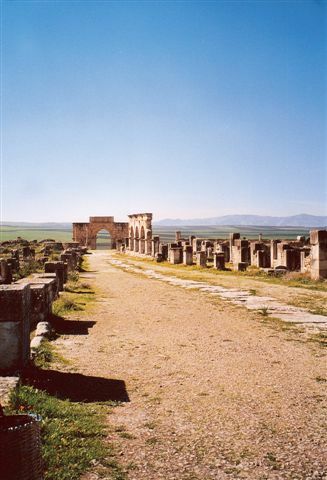 On the fourth day we departed for Chefchaouen, and an hour later stopped at Volubilis, which is the largest and best preserved Roman ruins in Morocco. It’s a Unesco World Heritage Site and should not be missed. It was one of the Romans most remote outposts. 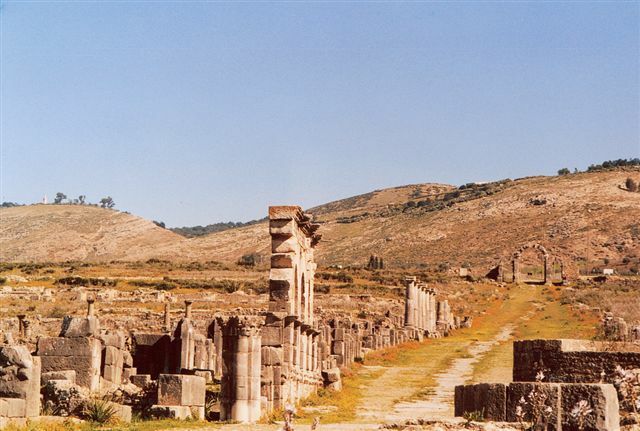 It is estimated that the city housed 20,000 people. We spent three hours wandering around this site. Then on through the Rif Mountains. When travelling through this area its advisable not to stop and if you do, don’t let your caravan/campervan out of your sight. This is Kif country, (Marijuana) The word Kif meaning pleasure in Arabic. Its cultivation is widespread and is tolerated, and some villages grow nothing else. Liz got approached and asked if she would like some chocolate. Her eyes lit up, as she hadn’t seen a bar in months. It turned out it was Kif! Another word they use is sunshine. It has been know that dealers will strap Marijuana to the underside of your vehicles and then inform the police who will stop and search you. If found in possession you’re nicked. It shows the outside world that the police are doing their job!! Chefchaouen’s campsite (Camping Azilan) Is on top of a hill overlooking the town, Basic but clean amongst trees with a restaurant. It’s a good 30-minute walk down a steep hill into town and longer coming back up. We took the car, but you can get a petit taxi for a couple of Euros. 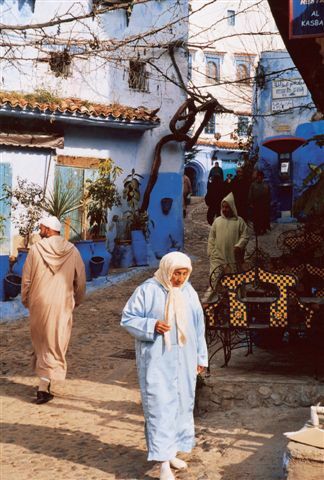 Now Chefchaouen. What a place to be your last stop over in Morocco. We loved it. Its narrow streets, courtyards, open squares with cafes, upmarket hotels, restaurants and boutiques. Every thing happens here from seeing 50/60-year-old hippies still making return visits to smoke as much Kif as they want. We met a guy from England who told us that he spends most of the winter months here It’s the ideal place to chill out and take in its superb atmosphere. 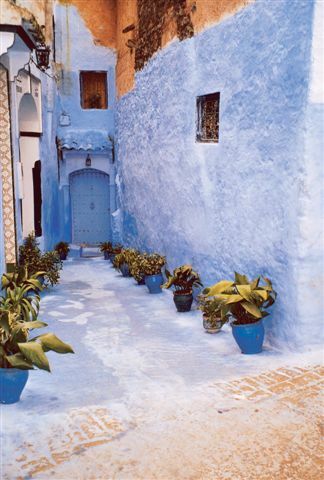 The Medina with its buildings is almost fluorescent in blue and white colour, even the edges of the paths are painted blue and when you see them completely painted over you know you have entered a dead end. Quiet a lot of tourists end up here to trek through the mountains, gorges and valleys. We saw one tour leaving with guides and pack mules carrying all the gear, and independents stocking up with provisions in town with rucksacks and tents, to go it alone. The following morning February 25th having spent nearly three months in Morocco we left Chefchaouen for the 50 mile drive back to Ceuta to catch the ferry across the Straights of Gibraltar and back into Europe, from where we came. Twenty miles down the road it started to rain. The first rain since the night we spent in Algeciras on the last day of November!! It was sad to see Morocco getting further and further away from us as neared the coast of Spain but we know that we will return soon, to meet once again the wonderful smiling, people who made us so welcome in their country. Now then which way is the French Alps? We returned home at the end of March having covered a distance of 12500 miles. Excellent tow car never had a problem from new. Diesel (Gasoil) cost about 6 Dirham = 35p litre. Super leaded & Unleaded about 10 Dirham = 65p Litre. If you are arriving in Morocco via Ceuta or heading for mainland Spain it is best to arrive with a near empty tank as fuel is duty free. Please note that this was the price before the steep rise in the price of fuel oil on the world market. In Morocco you drive on the right as in Spain. Driving during daylight is really no problem once you get use to the different ways they drive. But beware that traffic entering a roundabout from the right when you’re already on one. They have right of way, and they show it. So keep alert at all times. After dark is a different matter. You will find that some vehicles drive with no lights on at all!! You will find that schoolchildren, cycles, mopeds horse & carts donkeys litter the roads in the early evening, not only in the towns and villages which many have no street lighting but also in rural areas. We challenge fellow travellers to spot a speed camera or traffic warden!! We found it to be very good. It even shows you where the towns and villages in the south that have petrol stations, plus it has City plans of Marrakesh, Casablanca, Rabat and Fez. Forget travellers cheques, credit cards etc. They only know one word and that’s CASH. Unless you are in a main tourist centre, and you are liable to pay a surcharge. In all towns and city’s you will find ATMs. They are a common site. They accept, Visa, MasterCard Cirrus, Maestro etc. The daily limit being 2,000 Dirham. We had no problem in obtaining cash. Mobile phones cover over 85% of the population compared to land lines which is 6% Using a UK Sim Card is expensive, get a Moroccan one, and don’t forget to inform your friends of the new number you will be given. We had absolutely no problems whatsoever, and speaking to other fellow travellers, they agreed. It seems some people had encountered problems in Spain!! Morocco can be frustrating,unexplainable,mind-blowing,and a whole host of other things,but hang in there!! It was truly a unique experience like no other. Prepare to have your senses assaulted!!!! So take a deep breath and dive in !! (Quote from Lonely Planet Morocco, which we found invaluable 1 dog-eared copy for sale!! !